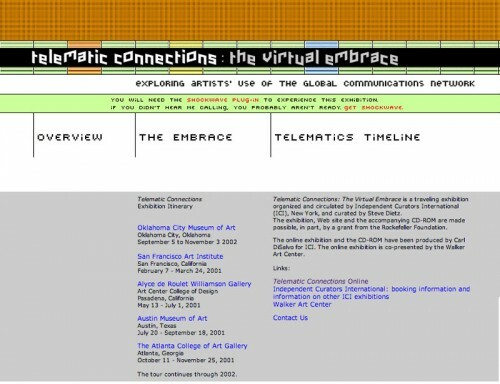 Telematic Connections: The Virtual Embrace is a traveling exhibition organized and circulated by Independent Curators International (ICI), New York, and curated by Steve Dietz. The exhibition, Web site and the accompanying CD-ROM are made possible, in part, by a grant from the Rockefeller Foundation. The online exhibition and the CD-ROM have been produced by Carl DiSalvo for ICI. The online exhibition is co-presented by the Walker Art Center.